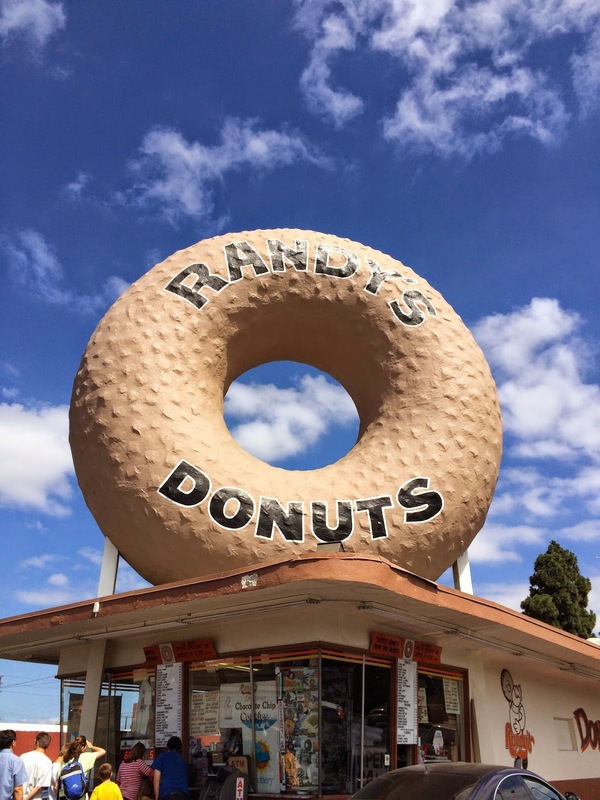 I've been longing for going to "Randy's Donuts" shop in Inglewood, near LA International Airport. I think first time I saw a humongous donut sign for a donut shop was on The Simpsons. 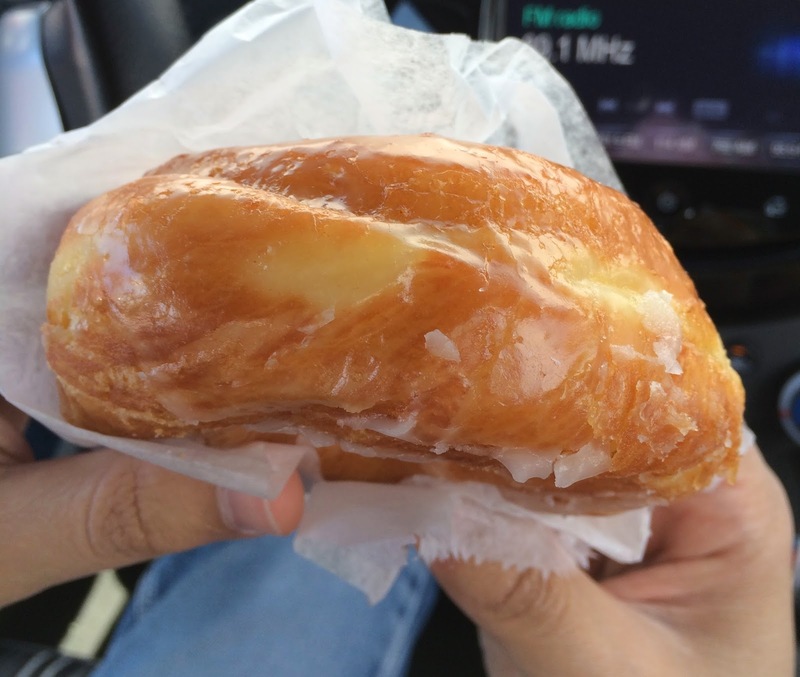 Then, some years later, incidentally I saw a friend of mine, Randy, posted a photo of Randy's Donuts afterwards, then that's the time I learned the donut sign exists. It's build in 1953 as a drive-thru donut shop. 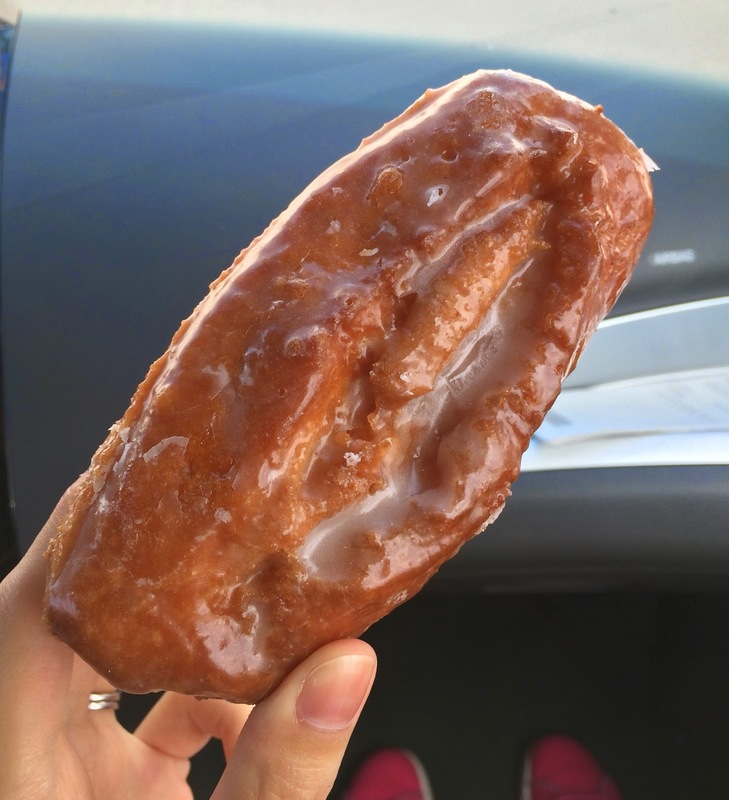 When we're driving to the destination, I already saw a donut in the blue sky. Here we are, "Randy's Donuts." 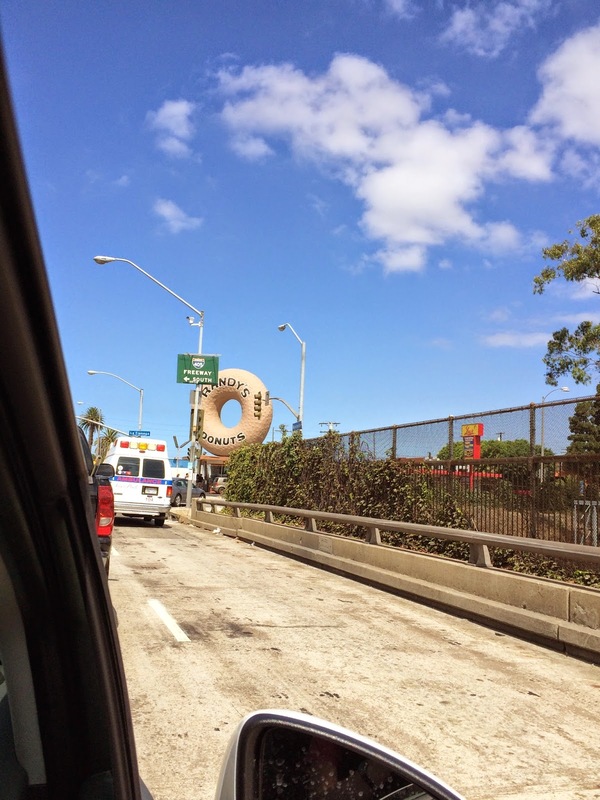 I could see how big the donut sign was; larger than a car. 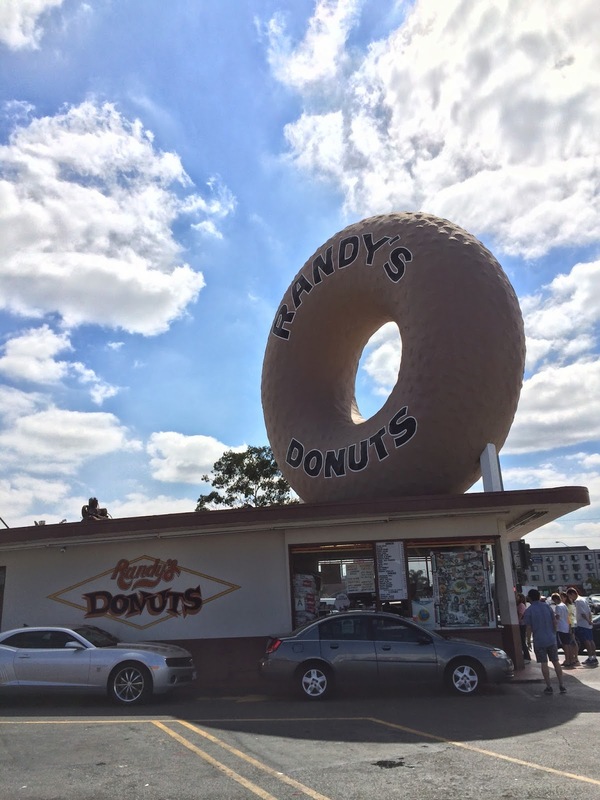 Both sides have "Randy's Donuts." Wall with logo and drive-thru arrow on the ground. The window to order was as small as a movie ticket booth. 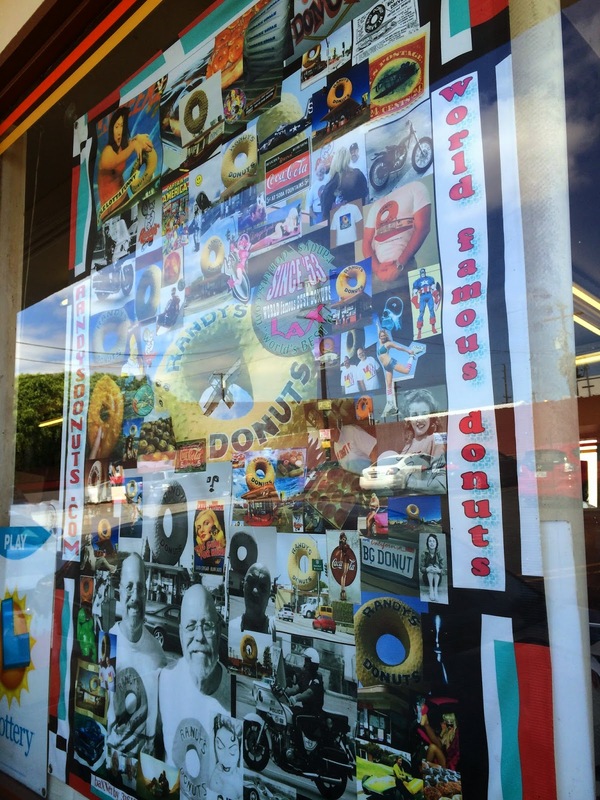 There're a lot of photos related to the Randy's Donuts. 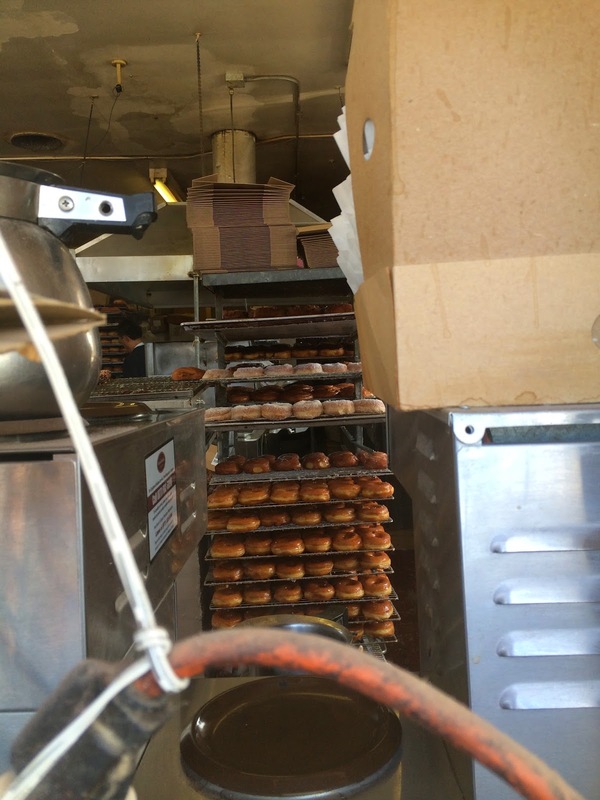 In the shop, a lot of donuts were produced. 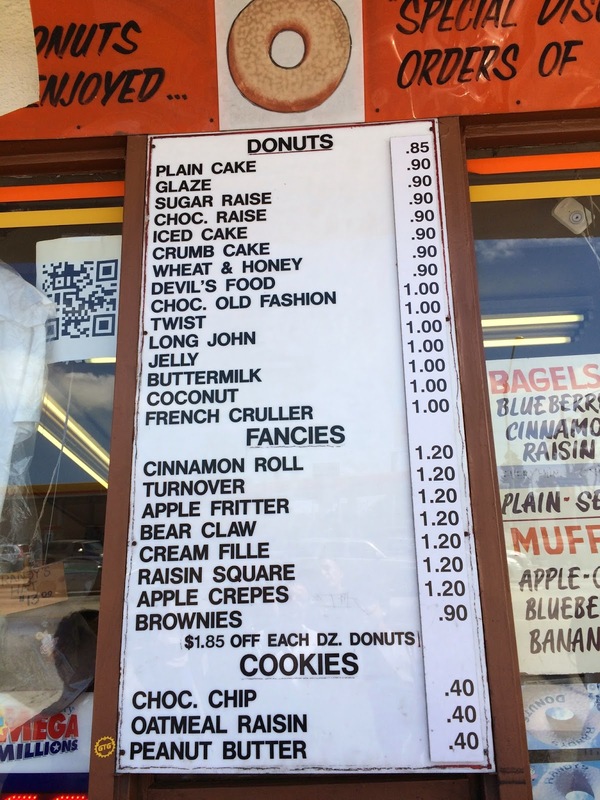 A list of donuts and prices were right above the mini window. I chose Choc. Raise and Buttermilk, and my husband got Sugar Raise. 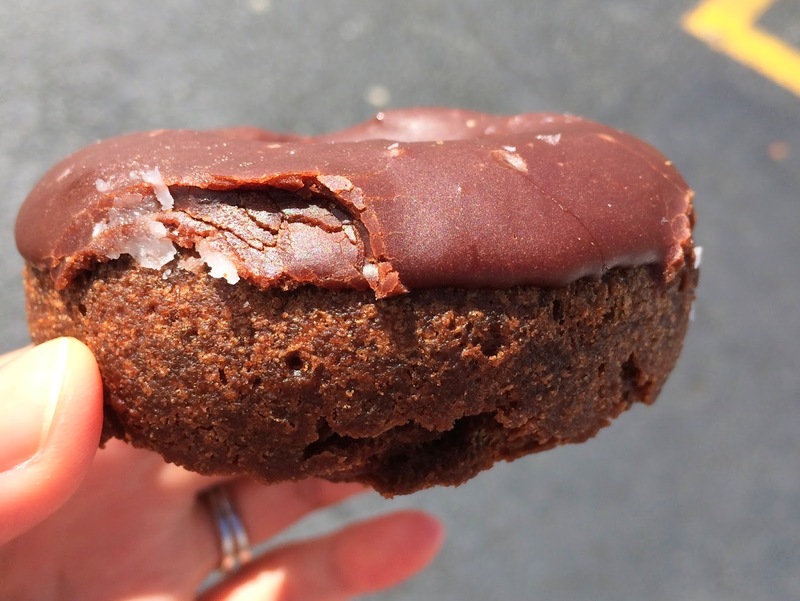 It's a chocolate covered chocolate cake donut. The dough was soft, bouncy, and moist so that I didn't get thirsty. The chocolate on the top wasn't too sweet so it had a great balance with the cake dough. 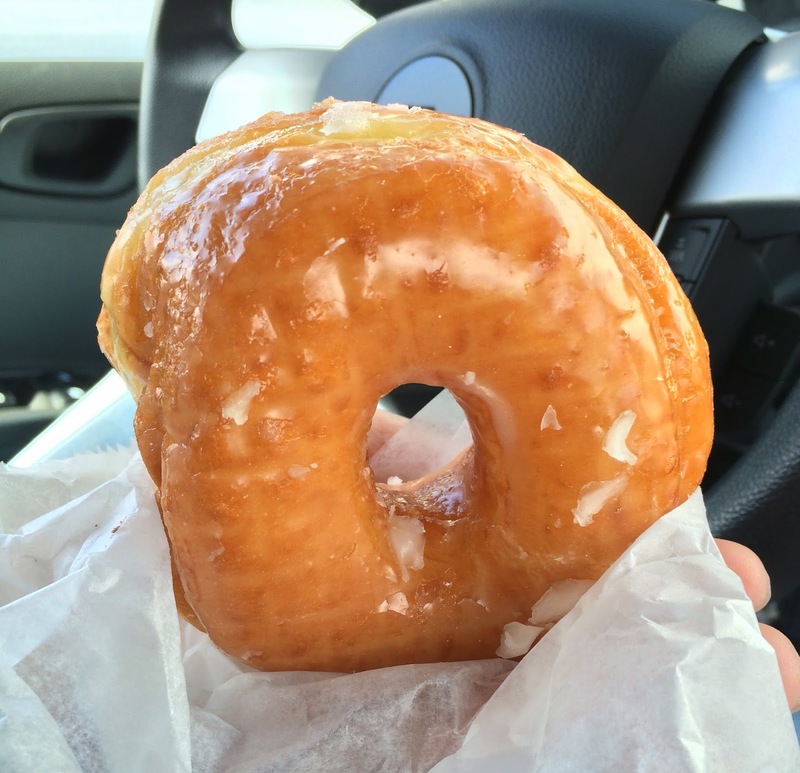 It looked similar to Krispy Kreme Doughnuts, but larger and thicker. 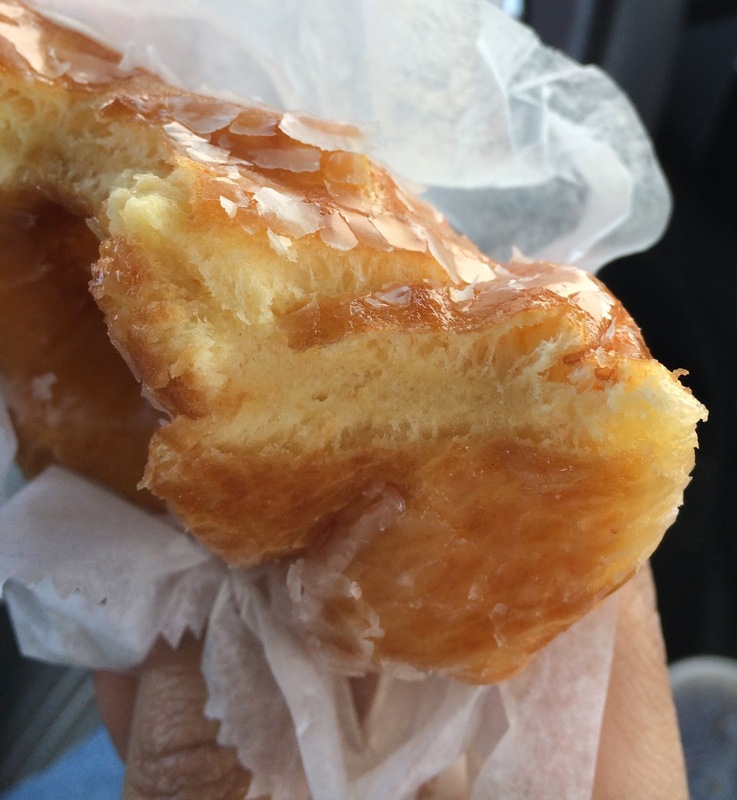 It's light and a bit chewy donut, and you can see how soft and airy this donut was as the donut sunk and didn't fully turn back. 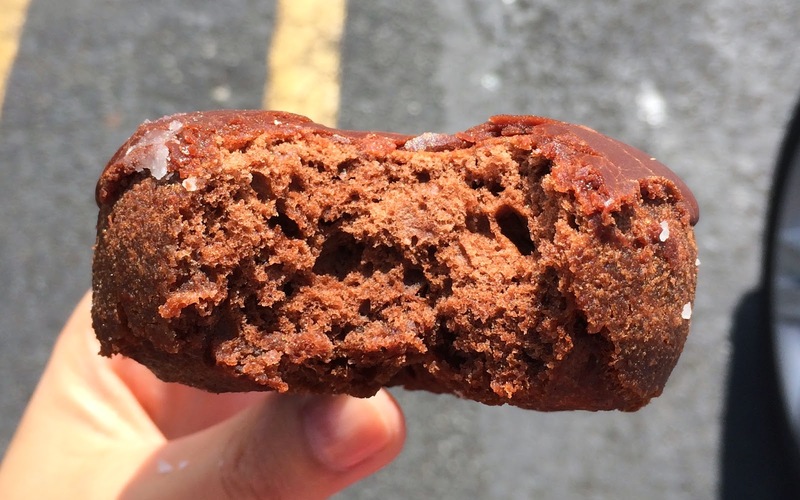 The donut melted away while chewing. 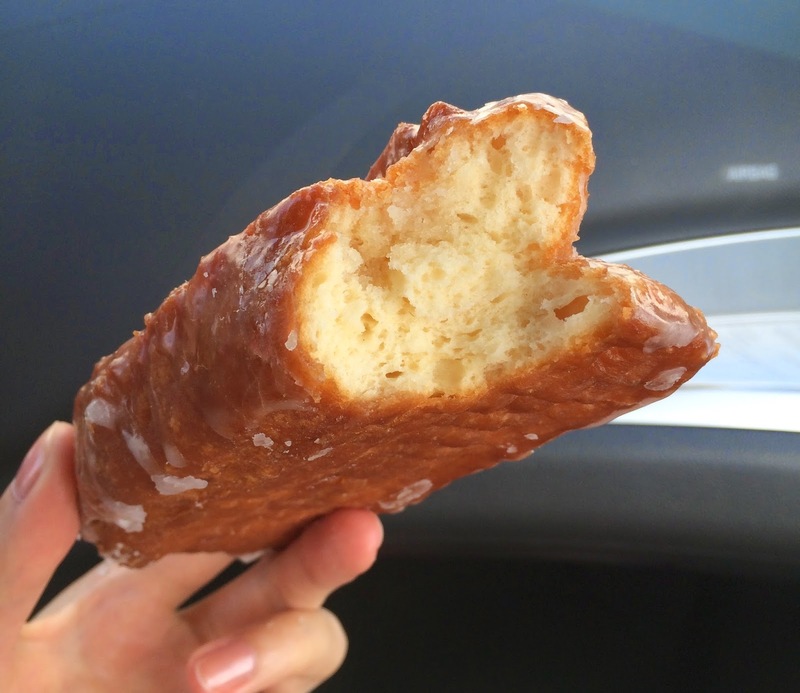 My husband isn't a big fan of airy and melt-away type of donuts, but he said, "This is really good." So I assume he really liked this donut. 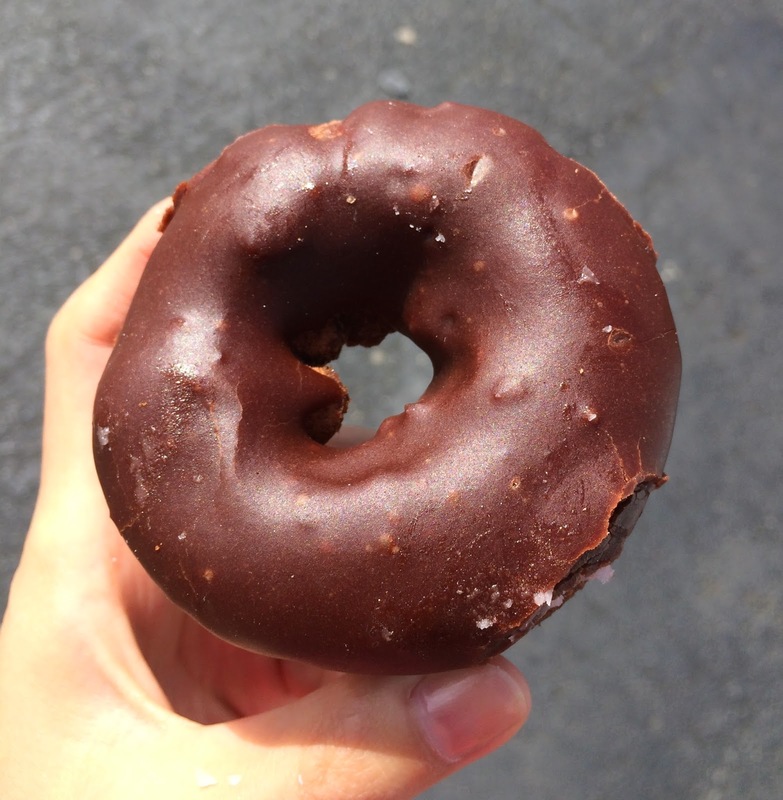 It's a a bit curved rectangle donut, and one side of the donut was split into V-shape from expansion. 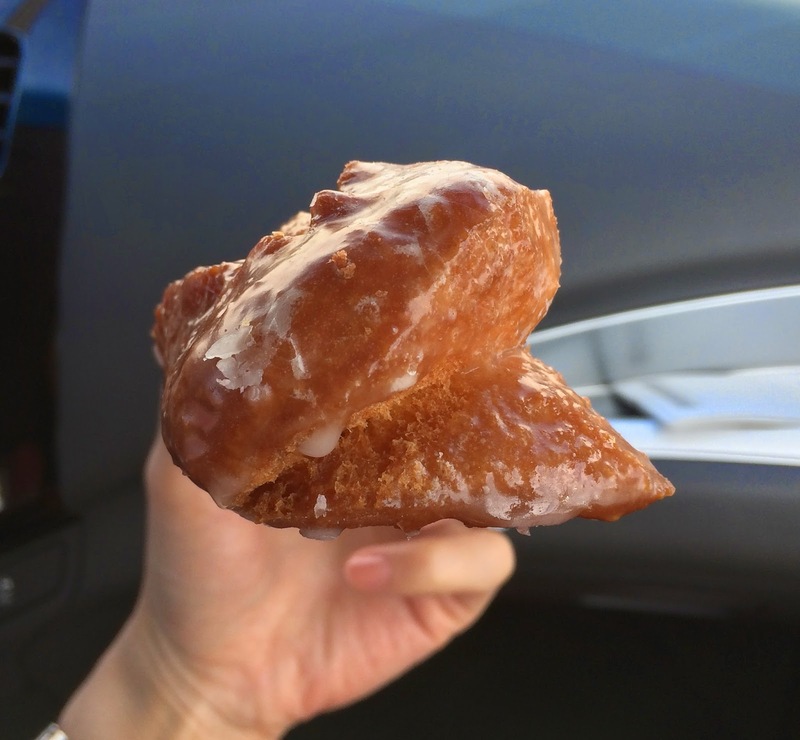 The distinctive flavor from buttermilk enhanced the sweetness of the sugar coating. The dough was heavier and drier than Choc. Raise, so I had to drink something. We saw constantly cars were coming in either to the drive-thru or parking lot to buy from the window. And we saw some cops in uniform buying donuts, which made me have a classic image of them: Eating donuts in the uniform. For this size, taste, quality, each item was incredibly reasonable.